That the cold coalition between the Democratic Alliance (DA) and the Economic Freedom Fighters (EFF), forged to kick the African National Congress (ANC) out of important metros, has always been in trouble, is no secret. 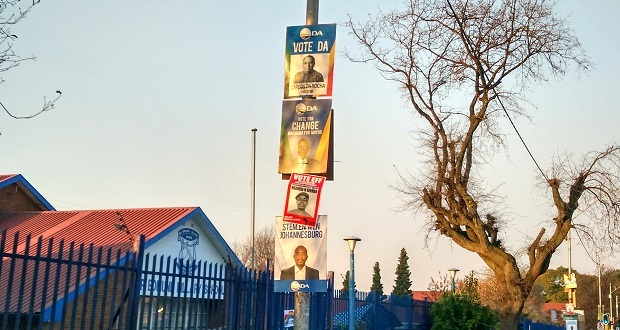 The DAâ€™s election messaging on the EFF is to tie it to the ANC, as was shown by an election poster unveiled in the Western Cape earlier this week. However, itâ€™s unlikely the official opposition will push this too far – after all, there will still be metros to govern after the elections are over, and it cannot govern there without EFF votes. As part of its campaigning in the Western Cape for the 2019 national elections, the DA erected posters in the Cape Town CBD on January 21 reading â€œRegister to keep the ANC/EFF out of the Western Capeâ€.Â The party have sent out texts to voters in the Cape with similar messages about keeping out the ANC and EFF from the currently DA-run province. Responding to a question from The Daily Vox about this at a presser on January 23, EFF leader Julius Malema said this could harm future partnerships between the parties.Â â€œAfter putting up those posters and insulting us they will then ask us to vote with them?â€ Malema said the DA has been insulting the party. Last year Malema said the DA had been calling them â€œVBS lootersâ€ going as far as to SMS and call people to tell them not to vote for the EFF. This was following a Treasury report detailing how EFF deputy president Floyd Shivambuâ€™s brother, Brian Shivambu, allegedly sent R10 million of the stolen R16.1 million from people who banked at VBS, to Floyd, with the party receiving R1.3 million of that money in October. The EFF and the DA made a decision after the local government elections 2016 to cooperate with each other, enabling the DA to form coalition governments with DA mayors unseating their ANC counterparts in key metros such as Tshwane, Johannesburg, and Nelson Mandela Bay. DA communications director Mabine Seabe said the DA will campaign on its own in the elections as an individual party. â€œThere have been instances when the EFF has insulted the DA and its leadership and we have continued to work together for the sake of the people of South Africa,â€ Seabe said. Seabe was reacting to a question from The Daily Vox about EFF leader Julius Malemaâ€™s comments on January 23. The EFFâ€™s support of the DA has been tenacious. In 2018 they supported the calls by the United Democratic Movement (UDM) to remove the DAâ€™s Athol Trollip in the Nelson Mandela Bay Metropolitan.Â This led to Trollip losing a vote of confidence in the metro, and his mayorship.Â The metroâ€™s leadership then went to the UDM. â€œThe current coalition – although the EFF didnâ€™t want to call it a coalition – between the DA, the EFF, and the municipalities is not based on a principled position with shared vision across party lines,â€ political analyst Tasneem Essop said in an interview with The Daily Vox. This means the coalitions have been unstable in many municipalities. The EFF used this opportunity to threaten its support in municipalities as we saw in Nelson Mandela Bay, she said. The coalitions are based more on political expediency than current electioneering. â€œWhat happens after elections is still up for grabs. The electioneering will go on but when it comes down to it, how the numbers fall and which party needs to use another to get into government will be the most important factor,â€ she said. There was already enough political fodder for the EFF to object to voting with the DA even before the August 2016 elections. But given that they still went into these relationships and coalitions with the DA, that for Essop is the big question mark around how principled the EFF are they when it comes to electioneering. If the EFF does withdraw its support for the DA, this could put the DA Gauteng premier candidate Solly Msimanga in jeopardy. â€œThey say Msimanga will be Premier: with whose help?â€ he said at the presser, referring to the DAâ€™s dependence on the EFF. â€œThereâ€™s room for the DA to be a bit cautious,â€ Essop said. But she thinks the DAâ€™s electioneering style will not matter as much as we think. â€œTheyâ€™ll negotiate that after the elections. It will be a chip that the EFF will hold: they can say well you campaigned against us in this way, why should we give you the support now? But itâ€™s going to be a matter of balancing the numbers after the election,â€ Essop added.